How good is this for colour treated hair? 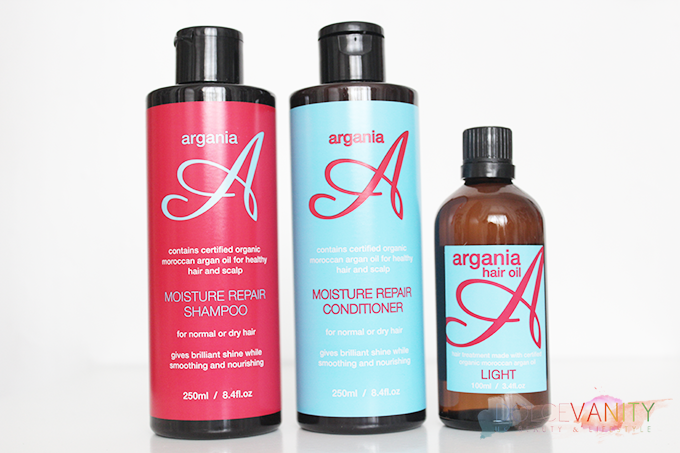 After my unsuccessful experience with the Go Blonder John Frieda range, I decided to start testing this Argania range from Boots that I was kindly sent for a review. Argania hair oil are made in New Zealand by mixing certified organic aragan oil, almond, jojoba, macadamia and evening primrose oils and Vitamin E. This treatment is to leave the hair silky smooth with a healthy shine. I was asked what my hair type at the moment is because with the Argania Hair Oil there are two types available all hair types & light coloured & fine hair with it being heavily coloured with hair dye & bleach of course I went with the latter. Maybe we need some more time together. Did I mention that Argania products are not tested on animals. Cruelty Free! I have fine, curly hair & lots of it. Prone to the halo-frizz and in high humidity, it can get knotty and curls loose all definition. I bought the moisture repair shampoo & conditioner and the light version of the oil....and I love it, so far! Noticed a smoothing effect from first use. Curls are more manageable and I'm not having to re-apply the oil as you would need to with some serums to tame frizz throughout the day. I was fortunate enough to carry out the humidity test on my recent trip to the Caribbean...my hair looked pretty much the same at the end of the day as it did in the morning -result! There was a little frizz, but not enough to faf over it. I have tried gazzilions of hair products (don't want to even think about the money wasted) and no doubt there'll be a new discovery soon to make your hair perfect (& I'll fall for all that rubbish it says on the packaging too :() but for now, I'm sticking to Argania.